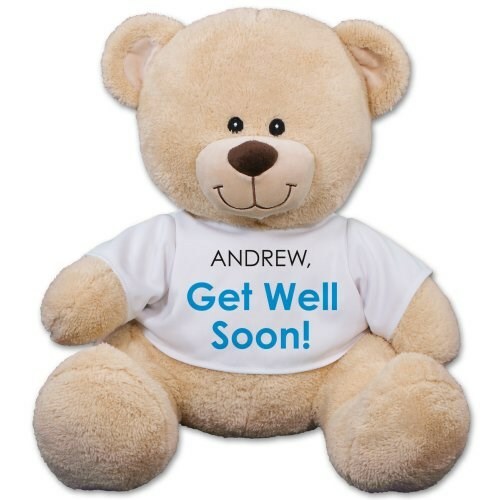 Send the warmest get well wishes to someone special using this thoughtful teddy bear. Wearing a t-shirt with our Get Well Soon design, this teddy bear is sure to help with a fast recover. This teddy bear features an irresistible look on his face along with a wonderfully soft feel. He has contrasting tan fur on the inside of his ears and his snout. Choose between three great sizes ranging from 11" to 21"! Free personalization of any name is included. Free gift wrapping and a free gift message are included to create a thoughtful presentation. Additional Details Shop for more get well bears to help a loved one get through their tough time.